I was at the Brickworks yesterday, meeting a friend. Little did we know, it was the GARLIC FEST. And the place was packed with garlic enthusiasts. Yes, there is a festival for garlic, I was told while in line while getting my parking authorized. When I laughed about a festival for garlic, a very serious garlic lover turned to me with an angry face, as though I had offended his church or his mother. After a walk and a drink, I went back to the jammed parking lot to leave. A car was parked in the middle of the path to get out, not blocking but certainly making the thoroughfare a little more difficult. I recognize this style, which is often found behind the wheel in North Toronto SUVs. 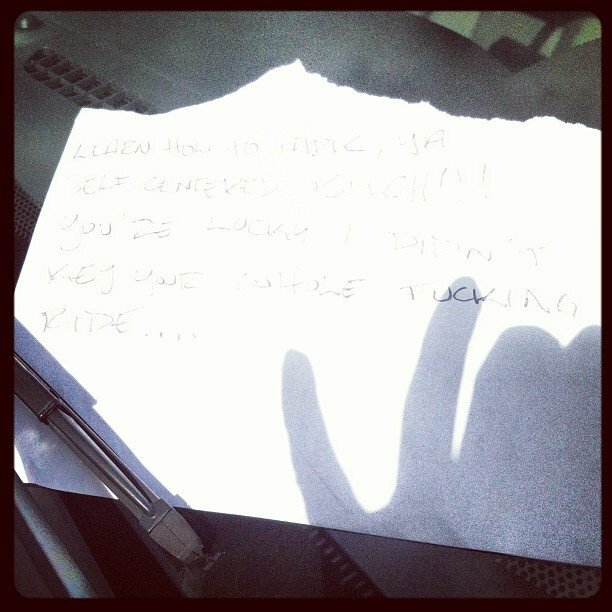 On its handsome windshield was a note with UPPER CASE ANGER. As much as this parking job was truly selfish, the anger of this letter took my breath away. It reminded me of when I experienced this once after parking a little off centre in a legitimate hospital parking spot. (Don’t hospital visits have more passion than garlic-fest visits?) I found it so upsetting, I wrote back. Take a look and tell me if you have ever been at the receiving end of public and/or out of control anonymous anger. yes. and that’s all i can say. it still upsets me and it’s 5 or 6 years later!